I performed an application spree for myself and applied for 6 cards. I earned between $1284 and $1521 for it. Look at all the cards that are available with sign-up bonuses, and pick the ones you like based on your situation. Use Great Canadian Rebates links for additional gains. The value I place on the bonuses I received is $1284 – $1521. In the second article of this series, I made a listing of the cards based on their “App-O-Rama Score”, which is my subjective valuation of how much I can get from them in an application spree. Here is the list, which includes all the pertinent information. The Gain is the monetary gain you will get by applying for this card. My main spender is the Scotia Amex Gold (my review here). The bulk of my spending is towards restaurants, gas and groceries, so I use the Scotia Amex Gold to return 4% on that spending. For any spending out of those categories, or for the rare places that don’t take American Express cards, I have the MBNA Travel Rewards card (which is currently branded as the World Elite). All spending here gets me 2% towards travel, also with no restrictions. I have the Amex Blue Sky card as an alternate that earns 1.25% on all spending. I also have my old MBNA Platinum Plus card that gets me 1% cash back. This card is my oldest card so keeping it open improves my credit score and the length of my credit history. I am also holding the CIBC Aerogold VISA Infinite card that gave me 15K and no annual fee in 2013. It returns 1.5 Aeroplan mile / $ at gas, grocery and drug store and 1 Aeroplan mile / $ everywhere else. Since I value an Aeroplan mile at only 1.25 cents each, this card will never compete with the MBNA Wold Elite or Scotia Amex Gold card for space in my wallet. The Great Canadian Rebates site gives you some of a referral bonus when you apply through their site. Some credit cards pay in the range of $30 or $50 for going to the application page through their site. That can make an already profitable application even more profitable. If I didn’t already have the Scotia Amex Gold, I would have applied for this card. It is the best card for spending on restaurants, gas and groceries, which is the bulk of my spending. It also comes with a first year free, and $150 in travel rewards as a sign-up bonus. Since I already have this card, I did not apply for it. I also skipped applying for the RBC Avion card this time around. RBC Avion points are great for people who travel a lot and know how to make good use of American Airlines and British Airways Avios. At this point, I have significant balances in those 2 programs. Also, this card does not waive the first year fee, so it really comes down to my personal preference of not “buying” the sign-up bonus miles in this situation. I actually bank with TD Bank and am regularly solicited for a credit card offer. When I asked them, they said I am already approved for a card based on my banking relationship with them. As a result, I realized that I didn’t have to waste a traditional application for any TD card. I simply waited until after the other banks approved me and then got the card from TD. 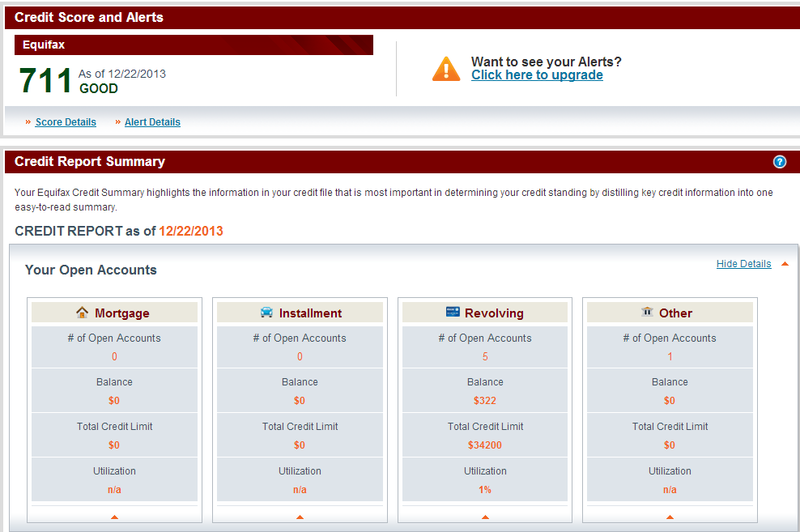 From various research I have done, Chase Canada seems to be the strictest and check multiple credit reporting agencies. I wanted to make sure that I got these applications in first to make sure I got approved for them. This is best in class card that gives 2 pts / $ spent on all spending. This card also gives 4 lounge passes each year with the annual fee, which is waived in the first year. The sign-up bonus is 30K points, which is worth $300 towards travel. The other great thing with this card is that every last point that I earn can be used for towards a flight. I won’t have any orphaned points if I just use the card once and redeem the points right away. This application is worth $300 towards travel and 4 lounge passes. I value that at about $340. This card is a decent card. Unfortunately, independent of the sign-up bonus, it is really only good for people who have a slightly different spending profile than myself, and who value Aeroplan miles or Delta miles at rates significantly more than I do. For me, they offer 25K Membership Rewards that will transfer 1:1 to Aeroplan or Delta after $500 of spending in 3 months. They also waive the annual fee, which means that apart from spending $500 on the card, that will be a free 25K Membership Rewards. I will spend $500 on this Amex card to earn 500 Membership Rewards points. That spending will come out of the spending that would normally go on my MBNA World Elite card and earn me 2%. I value Membership Rewards at 1.25 cents each. This application is worth 25,500 Membership Rewards for a cost of $10. I value that as a gain of $308.75. This card will get me 25K Alaska Airlines miles after the first purchase. Unfortunately, the annual fee is not covered in the first year. Those Alaska Airlines miles are most valuable to people in the west, namely Vancouver, Victoria, Calgary and Edmonton when used properly (by exploiting stopovers creatively). For someone like me, who lives in Toronto, these miles are going to come in valuable to offset a future trip on Emirates or another partner such as American Airlines or Delta. 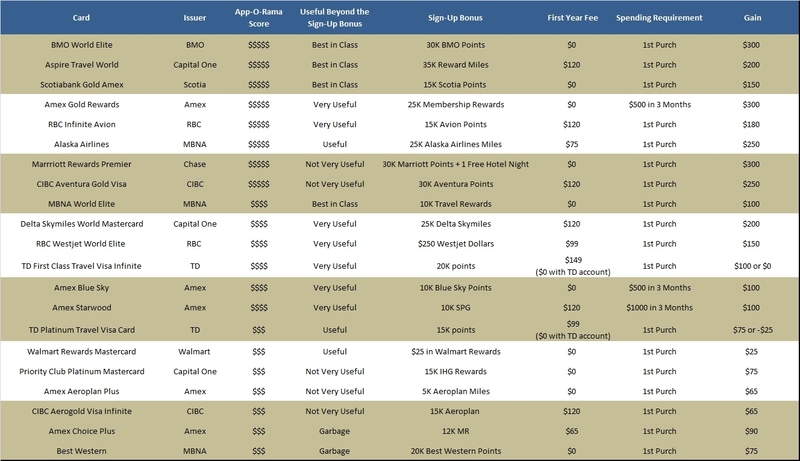 HackMyTrip does a great job talking about exploiting Alaska Airlines miles. This application works out to 25K Alaska Airline miles for $75. I value that as a gain of $237.50. This card offered me a free night at a category 1-4 hotel in the next year and 30K Marriott points after the first purchase. The 30K could be used for 2 off-peak nights at a category 4 hotel. It could also be used for higher level hotels if necessary. They also waive the annual fee. Beyond that signup bonus, this is a pretty crappy card. I use Hotwire and Priceline for much cheaper hotel stays (see my travel basics guides here), so the value of hotel points is limited. I don’t have any other applications with Chase so this was the best use of that application for a Chase card. This application is going to be worth 3 nights at a category 4 hotel. I value that at about $225. This card is relatively weak in comparison to the other cards in my wallet. It offers 20K TD points, which work out to offsetting $100 worth of travel. I also bank with TD and have an All-Inclusive banking package that offsets my annual fee on this credit card. This application is worth $100 of travel. Here are the results from my application spree. That works out to $1204 gained, and $238 still waiting due to the Alaska Airlines pending approval. I also received $80 from GreatCanadian Rebates for using their links for the credit card applications. I earned between $1284 and $1521 for this application spree. You can do it too. Good luck. I performed an application spree for myself and applied for 6 cards. I earned between $1284 and $1521 for it. Based on my needs, I applied for these cards.